Blackline Safety Corp. has made available Loner® M6, a monitoring device designed to help protect workers in the field. The device attaches to a worker's clothing and features a combination of automatic and manual safety triggers that initiate an emergency response process when needed. 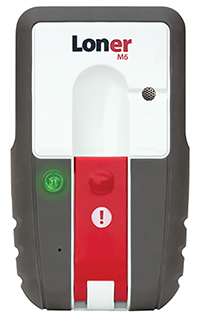 Loner M6's SOS latch is bright red and reportedly is easy to open, ensuring a worker in distress can quickly trigger an alert. The device can be placed in silent alert mode if a lone worker is facing a risk of physical assault. A blue LiveResponse light is activated when the live monitoring team has received an alert and initiated an emergency response. Loner M6's True Fall Detection® feature reportedly senses worker falls and nonmovement, triggering an alert if necessary. With traditional GPS technology and Blackline Safety's Location Beacon indoor location technology installed in the device, emergency responders can be directed to a lone worker's precise location. DEWALT® has added the 12V/20V MAX Jobsite Bluetooth® Speaker to its line of 20V MAX products. Featuring dual 3-inch subwoofers, the portable speaker is said to deliver premium sound while wirelessly streaming music and podcasts from a Bluetooth-equipped mobile device from a distance up to 100 feet. The impact-resistant speaker also features a carrying handle that can be used as a mobile phone stand, a storage tray under the handle and an integrated USB charging port for mobile devices. The 12V/20V MAX Jobsite Bluetooth Speaker can be powered with DEWALT 12V MAX, 20V MAX or FLEXVOLT® batteries or plugged into a 120-volt wall outlet using the speaker's standard detachable power cord.